Most of us know little about the Amish, a Christian group known for avoiding most modern technology, from cars to telephones. However, they are known, even to the most uninformed, for their delicious and traditionally prepared foods. 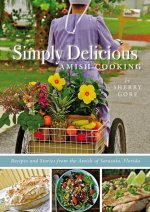 I was very happy to receive a copy of the spiral bound book Simply Delicious Amish Cooking: Recipes and Stories from the Amish of Sarasota, Florida by Sherry Gore. This beautiful little volume offers a wide variety of recipes gathered from Amish communities across the country, as well as notes of happenings from the Sunnyside Amish Mennonite Church of Sarasota, Florida. The first chapter begins with the author describing how she came to write this book. While trying to find an Amish cookbook from her community to give a friend, she discovered that such a book had yet to be written. As a weekly contributor to the century old Amish-Mennonite newspaper The Budget, she was able to send out a call for recipes. The result is this marvelous book packed with recipes ranging from appetizers to desserts, from breakfast to breads. Some of the recipes are a bit unexpected, such as the one for Alligator Stew, but I guess being in Florida, you make do with the local flora and fauna. Non-Amish cooks need not be overly concerned that the recipes require a lot of "from scratch" preparation. Many recipes include well-known time-saving ingredients such as Velveeta, "non dairy whipped topping" and Rotel. Mouth-watering color photos of many of the recipes make me eager to try them, and a helpful index at the back makes it easy to locate a favorite recipe again. I really enjoyed the recipes, cooking tips, photos and clippings of articles from The Budget that help to give a more vivid picture of the day-to-day life of the author. Her blurb on the back of the book mentions that, as well as being a writer, she is also an "official pie-contest judge" so I'm waiting for her follow-up book on how one trains for that occupation! If you're looking for a cookbook with simple, easy to prepare recipes made with ingredients you likely already have in your pantry (well, except for the alligator), this book is highly recommended! Thank you for such a lovely review. My next book with Zondervan publishers, Me, Myself & Pie, is a romantic comedy/pie recipe book about my relationship with pie. There's a whole chapter on my position as pie contest judge! It releases spring 2014. I hope you get a chance to read it, too!